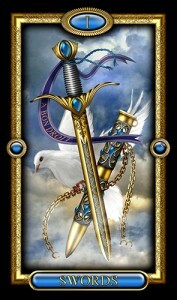 Swords is the suit of the intellect, rationality, and air – but also of strife and challenges. It most closely aligns with the season of Winter. 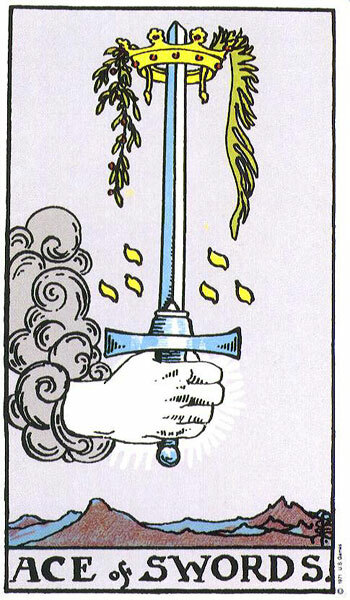 The Ace of Swords is a card of new beginnings, but specifically a new beginning that requires you to be strong in the face of potential adversity. Success will be yours if you act decisively, courageously and intelligently. 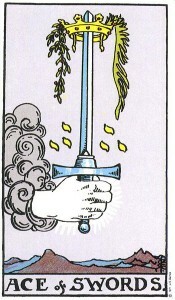 With this Ace, however, you can be assured that you are on the right path to achieve your goals. In a reading the Ace of Swords advises that you are about to be swept with new ideas and possibly new beliefs that help you resolve a long-standing problem or mystery. You are decisive and ready for action – though you should be careful not to move too quickly without concern for the emotional aspects of a situation. You have the urge to launch new projects (sometimes by cutting ties with old ones). You can solve any problem.